For the second time in 10 months, Maharashtra farmers cracked the whip on the government to turn spotlight on the grave agrarian crises gripping the state by completing a long march to the Legislature, here on Monday. 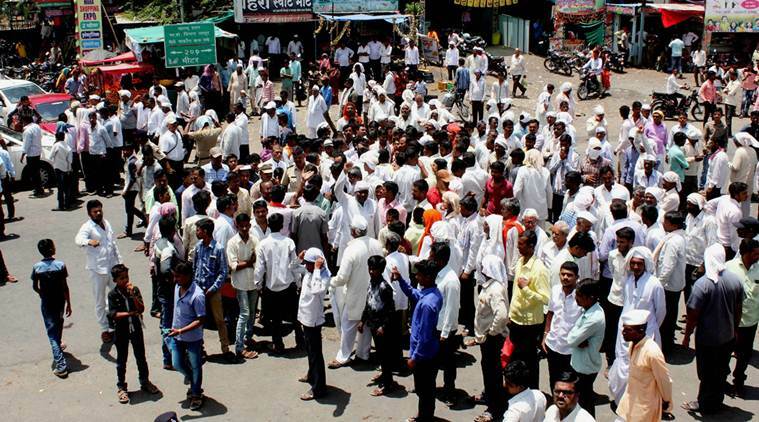 Braving the heat and blisters on their feet after covering a distance of 180km on foot over five days, protesting farmers from across Maharashtra reached the city on Sunday. Vishwanath Bagare (77) and Mirabai Mohan Badade (60) are among the thousands of farmers who have been walking barefoot for five days from Nashik to reach Vidhan Bhavan in Mumbai. Bagare and Mirabai, who hail from Varkheda and Korat villages in Nashik district respectively, maintained that they will not go home till their demands are not met. Maharashtra Navnirman Sena chief Raj Thackeray on Sunday came out in support of the farmers who have reached here after undertaking a ‘Long March’ to Mumbai from Nashik to press their various demands including full loan waiver. “This government is incapable of doing anything,” the MNS chief said, addressing thousands of farmers who rested at Somaiya Ground in Sion area after reaching the city this evening. Maharashtra Chief Minister Devendra Fadnavis on Sunday said his government will talk to the farmers who have undertaken a `Long March’ to the city to press their various demands. He also appealed agitators not to hold up the traffic tomorrow so that students appearing for Std 10th exams in the city are not delayed. All India Kisan Sabha’s protest march with over 30,000 farmers reached Azad Maidan before the break of dawn, at around 5 am this morning. A delegation of the protection tribal farmers will be meeting the Chief Minister at 2 pm. CPI leader Sitaram Yechury to address the protesting farmers at Azad Maidan at 2 pm. A sub-committee of ministers have been formed by the state government who will hold talks with the farmers delegation. The ministers in the sub-committee are Girish Mahajan, Eknath Shinde, Pandurang Fundkar, Subhash Deshmukh, Chandrakant Patil and Vishnu Sawara. Kisan Maha Sabha’s Ajit Navale says that if the government doesn’t give them a favorable reply they will sit on a indefinite fast at Azad Maidan. Chief minister Devendra Fadnavis assured before the House that the farmers issue will be considered in a sensitive and positive manner. He further added that he want to congratulate tribal brothers, they have conducted the morcha peacefully and in an organised manner. Most important question is that of rights on forest lands, which is the pressing issue of 95% people that have participated in the morcha. We want to reiterate that Govt is sensitive on all issues including this one. We will try solve the farmers issues in positive way. Would request the House to permit me to leave for meeting. Be the first to comment on "Updates on Maharashtra farmers protest: Fadnavis to meet farmers’s delegation today"